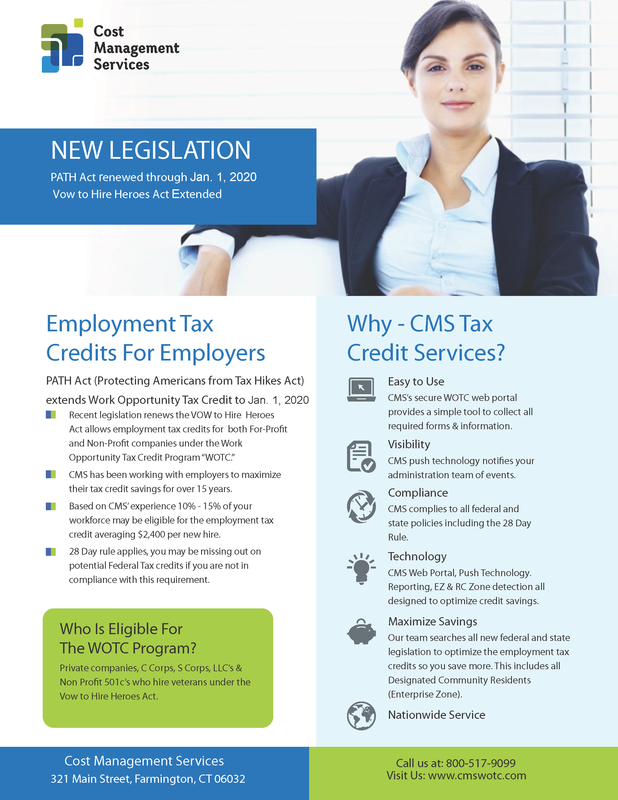 Did you know CMS offers an enhanced mobile design for the Work Opportunity Tax Credit survey? Customers can invite their new hires to complete the WOTC survey on any device, mobile phone, tablet, desktop, or laptop. The WOTC mobile responsive application will resize to accommodate any size of screen. The mobile friendly design makes completing the WOTC Survey both easy and convenient for new hires to use with any onboarding program. No more tax credits slipping through the cracks, and no more excuses not to get it done! Since 2014 CMS has allowed customers to do the Work Opportunity Tax Credit screening three flexible ways: Online, by Phone and by paper (fax/secure email.) We are pleased to offer mobile friendly online screening for our customers. Online screening is secure, fast and easy to use and understand for you new hires. Contact CMS Today to Start Saving Today! In our 22+ years of performing WOTC Screening and Administration we have saved millions for our customers. Don’t miss out on tax credits! This entry was posted in WOTC News and tagged CMS, cms wotc, Mobile Friendly, Mobile Friendly Work Opportunity Tax Credit Application, Work Opportunity Tax Credit, WOTC. Bookmark the permalink.